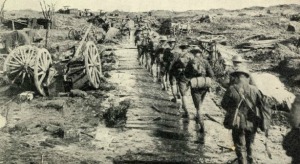 As I write, one hundred years ago today – on the 28th August 1917 – the fighting at Passchendaele came to a halt. The rain at last held off. The sun shone. The ground began to dry. Operations resumed on the 20th September … and once more the clouds gathered and the heavens opened. It is into this shining moment of reprieve that I situated A Whispered Name, and, more specifically, the court martial of Joseph Flanagan, a volunteer from the west of Ireland caught up in a war he’d ceased to understand, and a battle that would eventually claim the lives of 475,000 men. I had always been fascinated by military justice during World War 1. Without knowing where the image came from, I had grown up picturing a shell-shocked working-class lad brought before a hastily convened court, manned by smart officers who wrote in copperplate and pointed at things with a riding crop. Years later, after becoming a barrister, I wanted to know what had really happened in those makeshift courtrooms which had seen over three hundred men condemned to death for breaches of the Army Act first passed in1881. The writing of A Whispered Name was my opportunity to immerse myself in that long drawn out war and its legal shadow: the swift – and from our perspective – brutal implementation of justice. My aim was to tell the story of Joseph Flanagan against the backdrop of Passchendaele, to show what it must have been like back in 1917, as experienced by Flanagan, and to view that whole period from our standpoint, as seen through Anselm’s enquiring gaze. To do this, apart from researching the war itself, military justice in the field, and Passchendaele in particular, I wanted to know about the real trials of real people, tried by real judges in real places … leading to real executions by real firing squads observed by real medical officers, remembered afterwards by real veterans who’d never forgotten what they’d witnessed, or, in the case of a firing party, what they’d done. And so I went to the National Archives at Kew Gardens. I pored over various trial transcripts, war diaries, and other documents. And afterwards I traced the memoirs of those who’d been involved in a trial or an execution. Finally, I began knitting the various threads together. What I discovered will never leave my memory. At this point it might help if I explain the mechanics of a Field General Court Martial. After a man had been condemned to death – a foregone conclusion, given the law – the sentence was subject to a process of confirmation. The trial papers were passed from Brigade, to Division, to Corps, to Army. At each stage the relevant commander appended his view on the character of the individual concerned (whom they might not know), the evidence (which they had not heard), and whether the death penalty should be carried out (which may have nothing to do with the gravity of the offence). After a legal eye had been passed over the accumulated papers, they were laid on the desk of the Commander-in-Chief. The choice between reprieve and execution was his alone. Returning now to my visit to Kew Gardens, I can still remember how surprised I was when, on opening an archive cardboard box for the first time, I lifted out what looked like an ordinary trial brief … the sort of thing I’d received as a matter of course when at the Bar. It was still wrapped in white cotton tape. Inside were the original handwritten notes of evidence taken down by the court. Call it an active imagination, but for an instant, I felt I’d been there. I had the same experience with every box I opened. 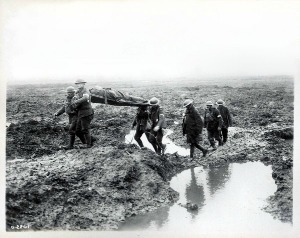 One case – that of Pte Bowerman was unforgettable. During the confirmation process, his brigade commander had observed, ‘the man … is quite worthless as a soldier or in any other capacity and is better removed from this world.’ After Bowerman had been shot the medical officer had filled in what can only be called a pro forma chit. It read ‘Death was …’, and the doctor had written in the space provided, ‘not instantaneous’. One cannot help but read into that underlining a hint of the horror he’d experienced; a horror that the doctor, the officer commanding the firing party, and those on the firing squad, would simply have to take in their stride. And maybe some of them did. Because one easily forgets the scale of killing and the daily casualty rates which prevailed at the time. This was forcibly brought home to me when I researched the background and fate of individual officers on a given court martial panel. Frequently, they’d just come out of the line. Their own regiments had suffered heavy, sometimes appalling losses, and, looking forward, some were doomed to die, often within a matter of months. This was the reality. Life was cheap. The brave literally vanished before one’s eyes, sometimes leaving nothing of themselves behind. Not even their identification tags. Small wonder, then, that pity wasn’t always on offer to those who’d run away. Which is all the more poignant, when one considers that chaplains and those who served on a firing squad, sometimes reported on the surprising display of courage shown by condemned men at the very last moment. They’d found their nerve when it no longer mattered. Whether Flanagan managed to survive the mechanics of justice is the novel’s secret. But his trial accurately relates what happened to many soldiers once they’d been charged with a capital offence. I’ll end with reality: some shirked their duty; others broke under the strain. All of them, in the end, were victims of war. Perhaps we might remember them, too, as we recall the slaughter of Passchendaele. 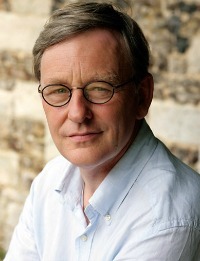 William Brodrick is the author of six Father Anselm novels including 'The Sixth Lamentation' which was included in the Richard and Judy List and 'A Whispered Name' which won the CWA Gold Dagger in 2009. Brodrick was once a practicing Augustinian friar before leaving to become a barrister. His time as a friar helps with his Father Anselm books. William Brodrick has just begun a new courtroom drama series under the name John Fairfax. His first novel, Summary Justice, is now available in paperback.